September 10, 2014, 9:33 PM · After some 200 performances of the Tchaikovsky Violin Concerto, Russian-born violinist Philippe Quint felt it was time to record this work that has been part of his musical backdrop since childhood. Last week, he released his first all-Russian album, a recording of the Tchaikovsky Violin Concerto, with with the Sofia Philharmonic led by conductor Martin Panteleev. Philippe performs the "Ruby" Stradivari of 1708 for the recording, which also includes Russian composer Anton Arensky's Quartet No. 2 in A minor, written in memory of Tchaikovsky and scored unconventionally for violin, viola and two cellos. When it comes to the "Tchaik," Philippe enjoys diving right into the controversy and contradiction that is this concerto -- so loved, so criticized and so often played since its semi-disastrous premiere in 1881. "What hasn't happened to this concerto?" Philippe said, laughing. "If you look at the history, everyone and their mother had a hand in the bowings, the editing, fingerings, interpretations, ideas. From the time it was conceived, it's incredible how many controversial things have taken place, how many urban legends have spread about this concerto, including the most famous one, which is: The concerto is 'unplayable.'" That is what the concerto's original dedicatee, Leopold Auer, is said to have pronounced upon reading the score. But is it true? "It's a total myth, at least based on my personal research," Philippe said. "The concerto was not proclaimed 'unplayable,' that is an English translation of the Russian word, 'unviolinistic,' which is what Leopold Auer said in his memoirs. He also did not exactly, as the history says, decline to play the piece. Again, in his memoirs, he explains that when he received the score of the concerto, he found the first movement quite lovely, the second movement beautiful, and then he felt that the third movement needed revisions. However, he was just appointed as professor at the Saint Petersburg conservatory as well as leader of the Russian Music Society with his quartet, and he said that he did not have enough time to give proper attention to the score of the Tchaikovsky Concerto, so he just put it away until he had the time. But in the meantime, Tchaikovsky grew very frustrated with the fact that Auer wasn't taking care of the score. He re-dedicated it to Adolph Brodsky, who was very happy to jump on the wagon and give the first performance of the piece in Vienna." But the drama was not over for the Tchaikovsky Violin Concerto. "From there, we jump into the most famous review of the concerto: "This music stinks to the ear!" by the meanest critic in Vienna, Eduard Hanslick," Philippe said. "Again, based on what I have read, my guess is that this was probably not a great performance. The orchestra didn't have enough time, the parts were not well-prepared, and Brodsky wasn't well-prepared. So it may have been quite a disastrous performance, giving the work a very bad first impression. The great Hanslick simply could not see through (that performance) and understand that this is actually a masterpiece." Philippe also uncovered more intrigue: "There is a mysterious performance by Leopold Damrosch in New York, with piano," Philippe said. "Yes, Leopold Damrosch, an American violinist, supposedly got his hands on the score and premiered the work in New York around the time it was written." Another person with great influence over the piece was the violinist Iosif Kotek, whose visit to Tchaikovsky at the lakeside Swiss village of Clarens likely spurred the creation of the concerto in the first place, after Kotek introduced Tchaikovsky to the score of Lalo's then-new "Symphonie Espagnole," among a number of other newly-published violin works. "(Kotek) had his hand in the future of the piece by editing and suggesting different passages, making it more violinistic, dynamics," Philippe said. Tchaikovsky himself made major changes to the piece, the biggest being that he pitched his original middle movement. "Tchaikovsky substituted the beautiful "Meditation" that he originally wrote for the Concerto with the "Canzonetta," and that's also a very interesting choice," Philippe said. Eventually Auer did get around to editing that last movement that he had found to be problematic, and his changes still leave us with a dilemma. For his recording, Quint recorded both Tchaikovsky's original third movement and the third movement as Auer edited it. The original version includes quite a few little passages that repeat themselves; Auer's version does away with those repetitions. "The third movement is what prompted me to do more research on the work and just keep thinking about it," Philippe said. "The new trend in the last couple of years is to play the original version, without cuts, and to view Auer's edits as being in bad taste and not what Tchaikovsky wrote. So the violin world is now split into two camps: one that think that the edited version is better and Tchaikovsky would have approved of it, and the other camp which says, 'This is classic Tchaikovsky redundancy, how can you cut the incredible music of Tchaikovsky?' I've had this conversation with a lot of my colleagues, and they have very strong opinions about this debate." "For me, I learned it with the Auer version," Philippe said. "Even if you look at relatively recent recordings of the concerto, with Perlman or Zukerman, and of course the old school with Heifetz, Milstein, Stern, Oistrakh, Kogan -- everyone played it with cuts. Is there a chance that they weren't aware of the Tchaikovsky original version? I doubt it. I really feel that they also felt that the Auer version is a better, more condensed, well-edited third movement, that it's more suitable for the concerto and flows better. This is my belief, but the reason I put both versions on the recording is for people to compare, because really, who knows? Would Tchaikovsky like (the edited version)? Auer helped Tchaikovsky with many works, and Tchaikovsky, I think, was always in doubt, always questioning. Perhaps even, he was easily influenced by his collaborators, like Kotek." "There's the same controversy about 'Valse-Scherzo,' by the way, which exists two versions," Philippe said. "One is longer, redundant, repetitive, and the other one was edited by, I'm not sure whom, nobody knows. I ran into this problem at a performance many, many years ago, when the conductor had the score of the original version of the Tchaikovsky 'Valse-Scherzo,' which I'd never heard about. And it was impossible for me to indicate the cuts, there were just too many, it was just too different from the version that I grew up with and always heard being performed by absolutely everybody. Philippe was 16 when he started learning the piece, and the first time he brought it to his teacher, Andrei Korsakov, "he was absolutely furious because I basically memorized the whole piece from recordings and performances that I'd heard -- I had barely looked at the page!" Philippe said. "I was so happy with the assignment, I wanted to impress my teacher by bringing the whole piece right away, playing it by memory." That's right, all three movements, by memory. "I think he appreciated my excitement and affinity for the work, but he said, in Russian, 'This is an absolute disaster. Go home, open the pages. Do not listen to recordings any more! And practice with a metronome, put everything back, pay attention to what Tchaikovsky wrote.'" Over the years, Philippe has undergone a long process: sorting through those early aural impressions, studying the score, taking in the advice of teachers and ultimately finding his own interpretation. "It's so individual, it's so personal," Philippe said. "Tchaikovsky really did give the performer an opportunity to properly display their personality and their musicianship. It's a very personal work and you can make it even more personal. Honestly, with this concerto, every time is like the very first time for me." And what to pair with the Tchaikovsky? Philippe saw the chance to give attention to a work that had been slightly neglected in choosing Anton Arensky's Quartet No. 2 in A minor. "Arensky is a little bit of an underrated composer -- in Russia, in fact, he was frequently called 'mini-Tchaikovsky' because he always possessed the same nostalgic, sentimental qualities, but not on a grand scale," Philippe said. "Arensky was a huge admirer of Tchaikovsky and Tchaikovsky was very supportive of Arensky." Arensky wrote the piece in memory of Tchaikovsky. "In the second movement Arensky uses a melody by Tchaikovsky, and in the outer movements he's using very religious Russian orthodox songs. So it has a great level of spiritual energy, which we thought would be an absolutely perfect fit." 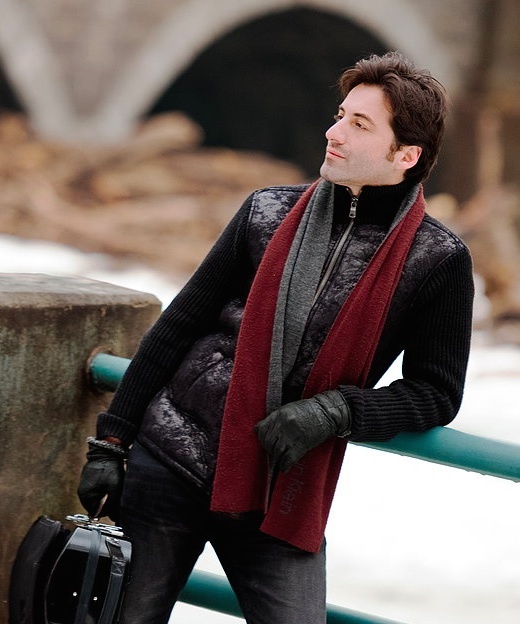 He called his collaboration with cellists Nicolas Altstaedt and Claudio Bohorquez, and violist Lily Francis "maybe one of the top collaborations in my life." "These guys were so professional and such perfectionists. We would not let one little thing slip." The group put the piece together in three days of 12-hour rehearsals and then two days of studio work. "We had so much fun. It's just tremendous to find such chemistry, given the fact that we're all such vastly different musicians, coming from such different backgrounds. It proves one fact only: music unites all," Philippe said. "That's what music is about, it's about this incredible joy, it's about chemistry, it's about having fun -- not taking it seriously when it's not necessary, and being extremely serious when the time calls for it. 'Give work love, and you shall be rewarded.' I can't remember who said it, but it's true!" September 11, 2014 at 01:06 PM · Good interview. I believe Ms. Francis spells her name "Lily," but that's the only niggling thing I could say. It's always fascinating when performers get involved in the historical/musicological elements of the piece, rather than just worrying about the best edition. That's a side of 'historically informed' performing that is so often overlooked. Quint's points are well made. Thank you, Laurie, for another think-worthy piece. September 11, 2014 at 03:47 PM · Thanks for the catch, Marjory, all fixed. The Tchaik seems so well-documented, it's hard to believe there is more to learn about its history, but I'd certainly never heard about the early New York debut with piano! September 11, 2014 at 04:33 PM · Laurie, I hadn't heard about that about the NY performance, either, but that sort of thing was much more common then than now--so many pieces, orchestral, chamber, what-have-you--were arranged for parlor performance on piano, or piano-+-one instrument. No phonographs, after all, so people had to entertain one another: novel concept, no? September 13, 2014 at 12:40 AM · what a wonderful artist! I have every one of Philippe Quints CDs but I think this one tops them all. The real treat is to see this fabulous artist perform in person, then you can truely observe his masterful skills on the violin. This CD definitely gives examples of his unmatched talent on the Stradivarius. A great addition to any classical CD collection. Only other thing I can say is it's Tchaikofsky, how can you not love this music. Bravo Mr. Quint! September 13, 2014 at 01:00 AM · Excellent interview. It is very interesting to know the history of these great works by Tchaikovsky. I've downloaded the CD and it is wonderful. I am a new fan to classical music which was initiated by attending a performance of the Philadelphia Orchestra featuring Yannick Nezet-Sequin along with Lisa Batiashvili. I began my collection with Lisa B and Nicolle Benedetti. I have every one of Philippe Quints CD but I think this one tops them all. Never in the world would I imagine humming De Falla or Rossini but this new found love for the sound of the violin has definitely changed my view of classical music. The real treat is to see these fabulous artists perform in person. I had the great opportunity to see Mr. Quint perform. it is then that you can truely observe his masterful skills on the violin. This CD definitely gives examples of his unmatched talent on the Stradivarius. A great addition to any classical CD collection. Bravo Mr. Quint! September 14, 2014 at 03:51 PM · By way of remaining on-topic, and in deference to Philippe Quint's wonderful recording, I won't compare it here to others I also love; however, I'd like to suggest an exploration of the recorded versions of the Tchaikovsky as a good topic for the writers here . . .